HomeFrontpageNewsEddie and the Penguins Save the World! Eddie and the Penguins Save the World! 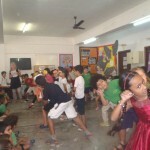 Year 2 children performed this Environmental Musical to families and friends. 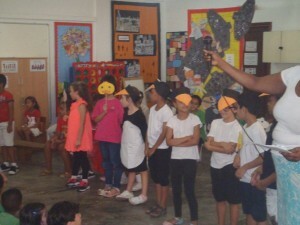 The show reflected what they had learnt this term about Recycling, Water Conservation, Pollution and Global warming. Children sang a variety of catchy tunes and travelled the world promoting eco-friendly issues. The students were certainly listening to Eddies’ important messages and they are recycling and reusing materials at school and home. Thanks for saving the world Eddie and the Penguins!